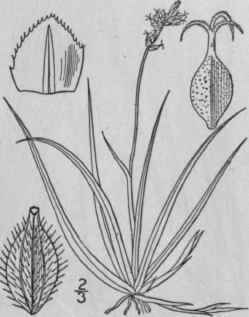 Carex Boottiana Benth. ; Boott, Bost. Journ. Nat. Hist. 5:112. 1845. Not H. & A. 1841. Carex picta Steud. Syn. PL Cyp. 184. 1855. 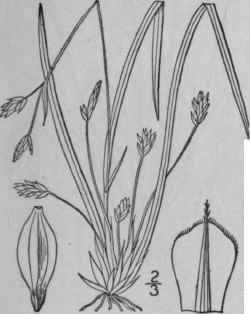 Dioecious, foliage glabrous, light green, culms phyl-lopodic, slender, smooth, erect or reclining, 4'-12' long, usually much shorter than the leaves. Leaves flat, 1 "-3" wide, the upper reduced to bladeless sheaths, tinged with reddish purple; spike solitary or rarely with a small accessory one near its base, erect, densely many-flowered, the staminate generally 1'-2' long, the pistillate cylindric but narrowed at the base, l'-2 1/2' long, 2"-4" thick; perigynia narrowly obovoid, strongly many-nerved, puberulent at least toward the obtuse summit, 2"-2 1/2" long, stipitate; scales reddish purple, usually with green midvein and hyaline margins, shining, obovate, obtuse, acute or cuspidate, longer and wider than the perigynia; stigmas 3. In woods, central Indiana; Alabama and Louisiana. Local. Summer. 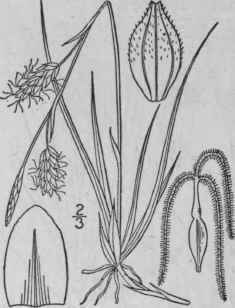 Carex pedunculata Muhl. ; Willd. Sp. PI. 4: 222. 1805. Densely matted, rather bright green, culms very slender, roughish above, diffuse, 3'-12' long, strongly purple-tinged at base. Leaves flat, 1"-1 1/2" wide, the basal commonly longer than the culms; upper sheaths green, almost bladeless, the lower with short leaf-like blades; terminal spike staminate, long-stalked, usually with some pistillate flowers at its base; lateral spikes 2-4, pistillate or androgynous, 3"-6" long, few-flowered, filiform-stalked and spreading or drooping, scattered, some of them appearing basal; perigynia obovoid, sharply 3-angled above, puberulent or becoming glabrous, 2" long, pale green, nerveless, narrowed below into a stipe, tipped with a minute entire beak; scales purplish, obovate, with green midrib, abruptly cuspidate or the lower subulate-awned, nearly equalling or lower exceeding perigynia; stigmas 3. In dry woods, Anticosti to Saskatchewan, south to Virginia, Pennsylvania and Iowa. May-July. 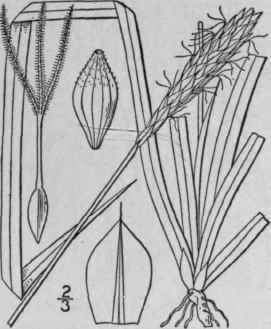 Carex concinna R. Br. Frank. Journ. 763. 1823. Caespitose and stoloniferous, the culms slender, nearly smooth, 2'-6' tall. Leaves about 1" wide, flat, pale green, much shorter than the culm; bracts reduced to green bladeless sheaths or occasionally with a short blade; staminate spike solitary, sessile or nearly so, 1 1/2-3' long; pistillate spikes 1-3, sessile and clustered or the lower one somewhat distant and stalked, erect, 2"- 4" long, 1 1/2"-2" thick, compactly 5-10-flowered; perigynia oblong-ovoid, 3-angled, pubescent, very short-beaked, obscurely nerved, about twice as long as the broadly ovate obtuse dark scales; stigmas 3. In rocky places. Quebec and New Brunswick to British Columbia. Summer.